Fundy Funeral Home has been operating on Westmorland Road in Saint John since 1995, offering comfort and support to those experiencing the loss of a loved one. It was in 2015 that Paul Daigle, the Managing Funeral Director, and his associates recognized the need to expand their facility to offer more to their community. Not surprisingly, this inspired the need for a complete renovation to update the existing Foyer, Chapel, Reception, Salon Rooms, and offices. It’s with enormous pleasure that we announce the completion of this project, and that it’s time to share the before & after with you! In January 2016, we began working with Paul and his team to assist them with their new expansion and renovating the interiors of existing building. Because this was our first funeral home we didn’t quite know what to expect! Thankfully we couldn’t have asked for a better client: Paul, and his team, were an absolute joy to work with. 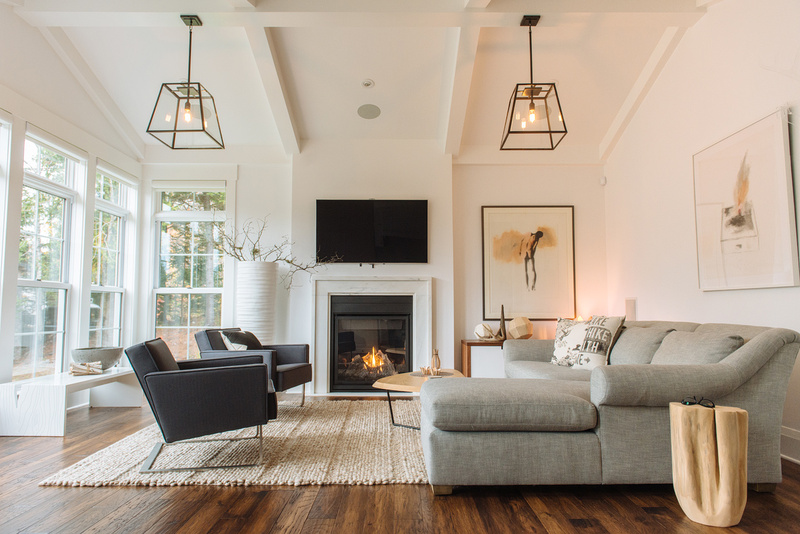 The scope: devise a design plan for the interiors of the new extension and upgrade existing interiors; ensure that the existing building matched the modernized aesthetic of the new build. The before photos feature the existing building’s salon rooms, chapel, reception area, and main lobby. Pictured below is Paul Daigle. 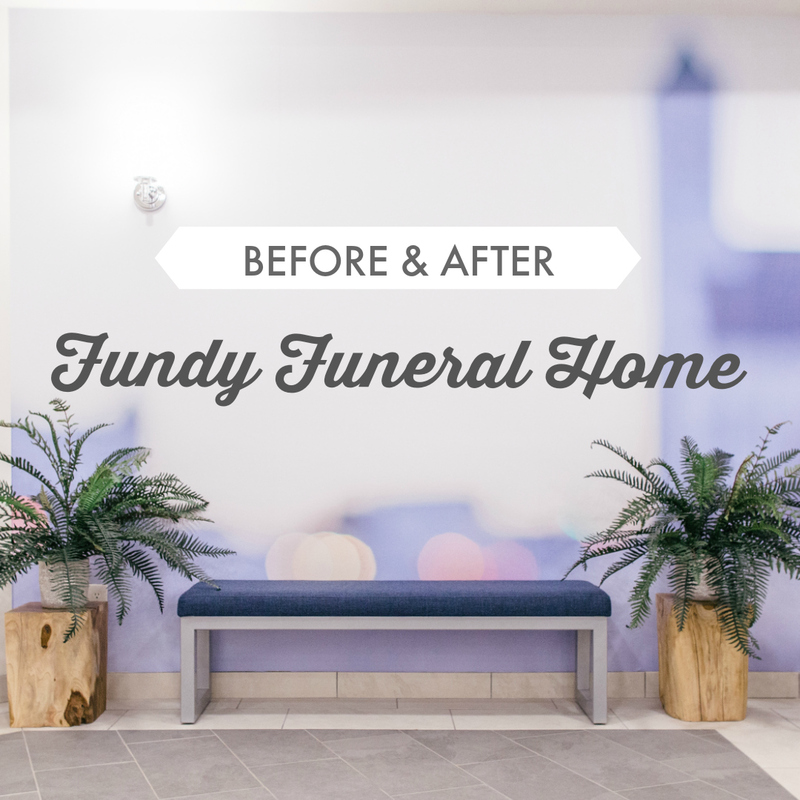 Of course a HUGE thank you to Paul and his team at Fundy Funeral Home for allowing us to be a part of this transformation! All of the After photography is by Kelly Lawson. The minimalist approach to the lobby pays homage to the original architecture of this space. By painting everything out with Benjamin Moore Dune White CC-70, we were able to refocus the attention on the stunning ceiling and the beautiful stained glass window above the chapel doors. New furniture from Gus* Modern and artwork by Kelly Lawson from her Bokeh Series was brought in to update the room. Kelly’s Bokeh series features images from around the Saint John area but taken out of focus giving lighting a soft glow and the images a blurred effect. The result is a calming series of photographs with beautiful colours and tones. Featured: Gus* Modern Danforth Chairs in Parliament Stone, Atwood Sofa in Totem Storm, and Belmont End Tables in Walnut Veneer all from Tuck Studio. Art: ‘Bokeh’ Series Photographs by Kelly Lawson printed and framed by Mario’s Picture Framing . Flooring: Ceragres Slab 12″ x 24″ Porcelain Tiles in Silver & Snow from Tuck Studio. Featured: Gus* Modern Danforth Chairs in Parliament Stone, and Belmont End Tables in Walnut Veneer from Tuck Studio. Art: ‘Bokeh’ Series Photographs by Kelly Lawson printed and framed by Mario’s Framing. Featured: Gus* Modern Atwood Sofa in Totem Storm from Tuck Studio. Art: ‘Bokeh’ Series Photographs by Kelly Lawson printed and framed by Mario’s Framing. In the chapel, the walls were painted Benjamin Moore Dune White CC-70, new carpets were laid, and fresh wallpaper hung along the back wall. This space, like the lobby, already had beautiful architectural elements. Our goal was to allow them to shine through. The existing stained glass windows and the solid oak accents really pop against the neutral backdrop. We hung mirrors opposite the stained glass windows to deepen to the existing symmetry in the room and reflect the glass at just the right angels. Wallpaper: JF Fabrics Magique 5101 62W6311 from Tuck Studio. The ceiling pendants remain from the beginning build. Small touches of colour, soft lighting, neutral white walls, and wood accents make for an inviting Reception area. The wood furniture also ties in the existing wood accents throughout the funeral home. Large scale 24″ x 24″ porcelain tiles minimize grout lines in such a large room. As the main transient place in the new extension, there wasn’t much room for furniture in the new Lobby. Which is why we opted to have Kelly’s Bokeh Series prints enlarged and installed as decals on the walls to add some more visual interest to the room. Featured: Trica Tubo Bench, and EQ3 Teak Stools. Flooring: Ceragres Slab 12″ x 24″ Porcelain Tiles in Silver & Snow all from Tuck Studio. Decal install by In Color Printing. Large 12″ x 24″ Slab tiles from Céragrès were installed to match the direction of the angular walls accenting the building’s architecture. Featured: Trica Mix Console Table, EQ3 Marcel Mirror Square, Trica Tubo Bench, and EQ3 Teak Stools. Flooring: Ceragres Slab 12″ x 24″ Porcelain Tiles in Silver & Snow. All from Tuck Studio. In the new extension there’s an area off the lobby for refreshments. We couldn’t resist repeating another one of Kelly’s beautiful Bokeh photos, enlarged and installed by In Color Printing. The soft colours and soothing movement make for an etherial and comforting space! Featured: Tables and chairs purchased from the Dodge Company Canada Ltd/Holsag Canada represented by Bill Sampson, [email protected]. Flooring: Ceragres Slab 12″ x 24″ Porcelain Tiles in Silver & Snow from Tuck Studio. The Salon Rooms, where visitation takes place, needed to be versatile and modular with interchangeable furniture and neutral backdrops. A subtle textured wallpaper hangs at the back of each room and is framed by new furniture from Gus* Modern & EQ3, and carpet tiles from Wacky’s Flooring. One of the challenges in the Salon Rooms was coming up with a way to display photos and memorabilia. The solution? Stainless steel Picture Rails from Gus* Modern and a pin board that can be customized with photos by friends and families! Featured: EQ3 Rectangle Teak Stools from Tuck Studio. A new (and thoughtful) room in the funeral home’s extension is the Children’s Play area. Durable vinyl plank flooring, miniature furniture, and plenty of toys give kid’s an area to do what kid’s do best… PLAY! Flooring: Shaw Contract Vinyl Planks available from Wacky’s Flooring!